"I was playing basketball the other night, went up for a rebound, and came down on my ankle sideways. Hurt like crazy, and after 4 hours in the ER, they put me on crutches, and sent me home with instructions to rest, as it was only a sprain." "Last weekend was the annual church softball game. I was running the bases, rounded second, and twisted my ankle. Swelled up like a grapefruit, I couldn't walk on it, and after seeing my family doc, was told to rest, and that it was only a sprain." 3 months later, I end up seeing these athletes in at my sports medicine clinic, still complaining of ankle pain and discomfort, trouble participating in sports activities, and some even having pain with daily living activities. Sprained ankles are a very common injury in sports. Some athletes will tell you that they sprain their ankle 2 or 3 times a season. Others relay stories of the worst sprain ever, spending weeks on crutches, and never really getting better. But what exactly is an ankle sprain? Well to figure that out, we need to look at the difference between a sprain and a strain...and yes, there is a difference. Sprains are an injury to a ligament. Ligaments are the connective tissue that attaches one bone to another bone. Strains on the other hand, are injuries to tendons or muscles. Tendons are the connective tissue that connects muscle to bone. And muscles...well, you know what those are. 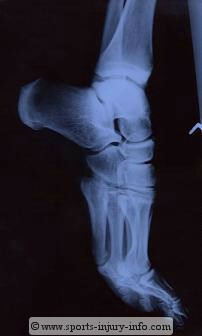 The actual damage that takes place is a tearing of the ligament or tendon/muscle. Sprains and strains are usually graded on a 3 point scale to determine their severity. Grade I sprains/strains involve a small amount of tearing of the ligament or tendon/muscle fibers. Grade II sprains and strains are tearing of about half of the ligament or tendon/muscle fibers. Grade III sprains and strains are complete tears of the ligament or tendon/muscle fibers. Since we cannot actually see the fibers, sprains are generally graded by the amount of laxity or looseness present in the ligaments. Your athletic trainer or physician tests this. So a sprained ankle, in its simplest form, is an injury to the ligaments that connect the ankle. More specifically, the ligaments that connect the tibia or fibula to the talus. One reason that eversion ankle sprains are not as common is because the lateral malleolus (distal end of the fibula) extends down farther than the medial malleolus (distal end of the tibia) This provides a boney "block" to prevent excessive eversion. The medial ankle ligament (the deltoid ligament) is a much broader ligament than the three lateral ligaments, so it is harder to injure these ligaments during activities. And one more reason eversion sprains are not as common is that many activities, especially in sports, that cause ankle sprains involve lateral movements - cutting, pivoting, etc. These occur in a direction that lends itself to inversion of the ankle, thus an inversion sprain. Most sprained ankles occur with an "inversion" type of force. This is commonly described as "rolling" or "twisting" the ankle. It generally occurs when landing off balance after a jump, tripping over something, or landing on something unstable. Ankle sprains can be very painful, especially in the first 24 hours. Because of the damage to the ligaments, your ankle will swell. This is caused by the internal bleeding of the injured structures, and by your body's response to the trauma. Any time an injury occurs, your body begins the healing process by sending fluids and cells to the area to start healing. This is called inflammation. While it is a necessary part of healing, it needs to be controlled immediately. In addition to pain and swelling at the ankle, you may also notice some discoloration or "bruising" around the ankle, in the foot, or even at the toes. Various shades of black, blue, yellow, green, purple, etc can occur anywhere from 2-10 days after the initial injury. This is very normal, so don't freak out about this. This bruising is called ecchymosis, and is a result of the blood from the injury moving to the surface. It shows up along the foot and toes because gravity naturally pulls it down. The most important thing to do after an ankle sprain is to follow the RICE Principles. RICE stands for Rest, Ice, Compression, and Elevation. Following the initial treatment, rehabilitation that focuses on restoring range of motion, strength, balance and endurance is essential in order to return your ankle to normal function. An ankle sprain without rehabilitation sets you up for continued pain, recurrent swelling, and a much higher chance of re-injury. For a complete program to treat your sprained ankle and ankle pain, you not only need strengthening, but mobility and balance exercises as well. Ankle sprains are common sports injuries, and although they may be disregarded as a minor injury, they can have lasting effects. Understanding what has happened, the structures that are injured, and what to expect from an ankle injury is the first step in recovering. 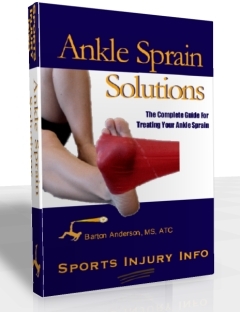 I invite you to learn more about treating a sprained ankle.